As diabetics, it’s easy for all of us to get caught up in the day-to-day management of our disease. After all, the regular monitoring of blood sugar, the injection or pumping of insulin, and the management of diet takes serious time and effort. So no wonder why you may feel overwhelmed when it comes to taking regular tests. Just take the test. You may need to give a few drops of blood. You may need to give a urine sample. Your arm might be squeezed by the blood pressure cuff. But go ahead and take test. It could well prevent a complication. It could even save your life. It’s important to step back regularly to see how our overall health is faring since diabetes is a systemic disease. It can affect nearly every part of our bodies, and every aspect of our lives. We shouldn’t fret about this — it’s a simple fact of the condition. Instead, make sure you take care of regular tests to know how you’re doing. This is the test everyone talks about, for a good reason. An A1C lets you know what your average blood sugar is for the past 2-3 months. Never mind the daily fluctuations — the A1C gives you the broadest overall picture. This is important because your overall health will be determined by your long-term management. So if you A1C is low and consistent, you know you’re doing a good job, even if you sometimes have challenges in your daily management. If your A1C swings around, or goes high, you know that you’ll need to tweak your treatment plan. What’s a good A1C? According to the American Diabetes Association, diabetics should aim for a 7 percent or below. According to the American Society of Endocrinologists, you should aim for a 6.5 or below. Some doctors urge even lower numbers; A1Cs for nondiabetics are generally below 6 percent. Unlike the other blood tests listed here, you’ll want to have an A1C performed more frequently than once a year. If your control is stable, a doctor may recommend the test twice a year. If you have more issues, or aree 1, it’s likely you’ll need to have the test performed quarterly. This is another crucial test for diabetics, for the simple reason that cardiovascular issues (heart attacks and strokes) are the most serious potential side effects of the disease. Other complications can cause serious problems, yes, but a healthy heart is of critical importance. That being said, cholesterol is a complex topic. Many books have been written on the topic, and there is medical disagreement about how to interpret the results. Here’s a quick summary of the current thinking. A cholesterol test is really measuring several different components of your blood fats, and they have different levels of importance. Take your overall cholesterol, which is usually the largest number you’ll see. This number is actually of little importance on its own because it includes both “good” and “bad” cholesterol. “Bad” cholesterol is called LDL (or low-density lipoprotein) and doctors will want you to generally keep it below 100. That being said, there are different kinds of LDL particles, some of which are more harmful than others. The “good” cholesterol is called HDL (or high-density lipoprotein), and doctors generally want you to keep it above 40. Again, though, it seems as though there are also different kinds of HDL particles, some of which are more beneficial than others. You will also be tested for triglycerides, which are yet another kind of blood fat. Doctors will want that number to be below 150. Doctors will pay different attention to these numbers. They will often focus on LDL cholesterol because we have effective drugs (statins) that can reliably reduce it. That being said, evidence exists that HDL and triglycerides are more powerful predictors of cardiovascular issues. Raising HDL levels usually takes regular exercise, weight loss and dietary change. Again, talk to your doctors about what you should do. Cholesterol levels don’t fluctuate in the way that A1C levels do (unless you dramatically change your diet), so they will be tested less frequently. You’ll generally get one a year, unless your doctor wants to keep a closer watch on the levels. There are two important tests diabetics must have regularly to measure kidney function. This is crucial because kidney disease (and potential failure) is one of the most serious potential diabetic side effects. The best-known of these tests is probably a microalbumin test. This looks for protein in your urine. High blood sugars can damage the tiny, delicate blood vessels in the kidneys, causing trace amounts of protein to leak into the urine. Over time, if not addressed, this damage can progress to full-blown kidney failure and dialysis. Doctors will also want to test your blood creatinine levels. This number indicates how effectively your kidneys are filtering waste products. Taken with the microalbumin test, your doctor should be able to get a good idea of your overall kidney health. Of all diabetic complications, kidney problems have been one of the most effectively prevented and reduced. In part, this is because ACE inhibitors, a common blood pressure medication, help prevent kidney damage. Even if you don’t have kidney problems (or high blood pressure, for that matter), your doctor may want you to start an ACE inhibitor for just this reason. You’ll have your blood pressure checked at every doctor’s’ visit, and that’s as it should be. The test is quick and easy to perform, and it gives you immediate results. It’s another test that gives you insight into cardiovascular health, so pay attention if your numbers are elevated. In general, doctors will diagnose high blood pressure if your readings are above 140 systolic (the top number) and 90 diastolic (the bottom number). For most people, the numbers should be closer to 120/80. Diabetes can raise blood pressure, though, and there are generally no symptoms if you’re suffering from elevated levels. Again, there are cheap and effective drugs for lowering blood pressure, and your doctor will probably want you taking a drug, even if you numbers are only on the borderline of mildly elevated. At least twice a year, you should also have a foot exam. Your doctor will look at your feet carefully to make sure you don’t have any ulcers or abrasions. These can be especially risky for diabetics with impaired circulation. They will also check the pulse in your feet, another measure of the circulation in your extremities. Finally, your health care provider will likely test how sensitive your feet are, usually with a small plastic thread called a monofilament. This can help diagnose impaired sensation. If you’re diagnosed with foot problems, your doctor may recommend special shoes to reduce pressure on sensitive spots. Medication can also be prescribed if you’re suffering from pain caused by nerve damage. While most of the previous tests can be performed by a general practitioner, you’ll need to go to an eye doctor for this one. A diabetic eye exam looks specifically for the retinal damage that can be caused by high blood sugars. Surgery to seal off leaking blood vessels may be needed to preserve and protect your vision. The good news about eye complications is that they tend to be one of the earliest signs of poorly controlled diabetes. Good glycemic control has been shown to stop these problems and sometimes even reverse them. 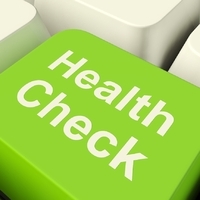 You will also need to be checked over generally. Health can’t be reduced to one disease or set of complications. Your overall wellness is important too. That’s why you should have a general checkup at least once a year, in addition to all of the aforementioned tests. Your doctor will let you know how your overall health is faring and what you can do to stay on track. Going through this list of tests seems daunting. It makes having diabetes seem like a parade of drudgery, of constant trips to the doctor. And we can’t lie — that’s definitely an aspect of managing the disease. It’s not fun, and it can be nerve-wracking to wait for your results. But the good news embedded in this list of tests is that nearly any problem they detect can be addressed. If issues are found early, simple and effective treatments exist. Even moderate to severe complications and problems can often be treated and resolved. But you have to know what you’re facing first. These tests will allow you and your doctor to figure that out. So get the test. Take the step. Your health demands it.